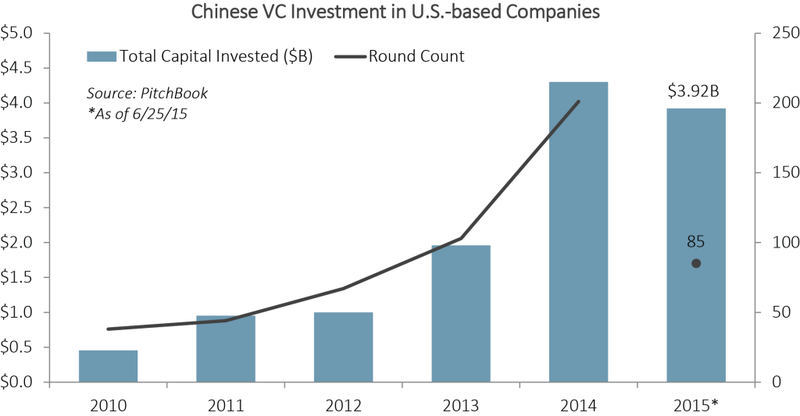 Chinese investment in the U.S. venture market has been exploding like fireworks over the past couple years. The number of rounds U.S. companies raised from investors based in China tripled from 67 in 2012 to 201 last year. In that same time frame, the total deal value surged from $1 billion to $4.3 billion, a 430% increase. Of the 169 unique investors in China active in the U.S. since 2010, however, not all of them have been rushing to the late stage. 46% of all VC financings done by those investors are classified as early stage in the PitchBook Platform, while 76% of all capital invested in 2015 to date has been in late-stage rounds. In essence, early stage activity hasn’t been dying down, but the unicorn-feeding frenzy has been primarily responsible for that immense jump in capital invested seen above. With that jump, of course, comes a commensurate increase in risk. It’ll be interesting to see just how these investors will eventually reap value from this spate of investment—as some predict, we could be on the cusp of a big boom in tech M&A or, perhaps, a gradual deflation. You can analyze the data for yourself to get your own take. Just read this walkthrough by my colleague Rose Thompson on the PitchBook search behind the data above, then click here to get a free trial of the PitchBook Platform to explore to your heart’s content. Featured image courtesy of Wikimedia Commons user Elyyo. Title courtesy of Rose Thompson.